Check out our progress on our 2018 Home-A-Rama home in Chatham Hills! This blog shows you all of the steps taken and real-time updates. Our home owners, Jim and Maureen, are empty nesters who wanted to take advantage of every view available. Whether you’re walking in the door, standing on the second-floor balcony, or entering the pocket office, it’s obvious that the stunning views were the primary focus during the design process. As a couple who love to entertain, Jim and Maureen wanted to focus on the main level open floor plan with the conveniently located wine room and large covered porch directly off the dining room. As grandparents, Jim and Maureen wanted a space reserved for their grand kids. We’ve created a second level with built in custom bunk beds that sit alongside an open game room/study. Check out our progression from start to finish with our 2018 HOME-A-RAMA home! The closing walk with the home owner has been completed and the home owners will begin moving their furniture into the home. During the closing walk, home owners will create a punch list of items that will be addressed by the construction manager. The final exterior paint is finished, carpet, hardwood and tile backsplash is installed. Landscaping and aqua systems have been completed. After this, the construction manager will have their final QC check through the home. Counter tops are installed and appliances are inspected after install. Maureen and Jim's selected lighting is installed. Concrete walk is completed as the landscape planning is finalized. The trim walk QC is completed as well with our clients. Drywall and insulation has been inspected. Interior paint selections have been ordered and the first coat of paint is completed! The garage door and trim have also been installed into their home. The roof has been installed allowing for drywall and insulation to begin! Masonry has started on the exterior of the home as Maureen selects interior paint selections with the help of Everything Home Designers during Interior Design Meeting #3. The mechanical Quality Check is completed. Hardware for cabinets is ordered and Interior Design Meeting #2 is completed. The electrical walk is completed with home owner Maureen and OTDG Construction Manager, Ragan during the framing process. The mechanical walk will be completed next. Trim pre-walk will occur prior to their exterior siding is installed, and exterior painting begins. Foundation Quality Check is completed so that framing can begin on the first and second levels of the home. Roof framing is started after the second level is framed. At ICC Floors, home owners Jim and Maureen look at samples of flooring and tile for all of the room in their new home. Pending weather, the basement and garage floor have been poured. Window wells for the basement are built. Pre-framing has begun for the next levels of the home. Excavation on the home has begun. Home owner, Maureen is busy selecting appliances and plumbing with the help of Everything Home and vendor Ferguson. The homes basement walls are being set and getting ready to be poured. Final Contract is signed by our home owners! Doors, windows and shingles are ordered, as these can take some time to arrive. Plan Design Consultations #1, #2 and #3 are completed. Preliminary Specifications and pricing is presented then if approved, ballpark pricing is presented for approval by home owners. 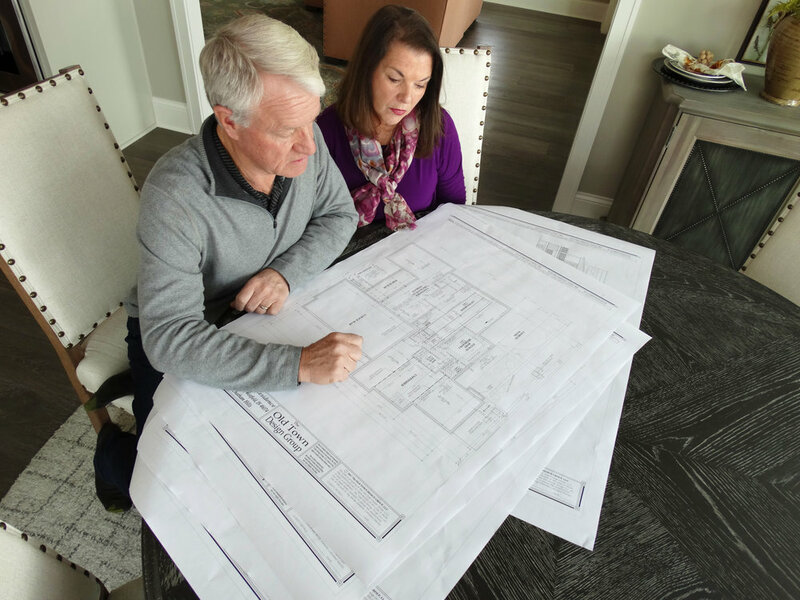 Home owners Jim and Maureen review the final plans of their dream home while meeting at the Chatham Hills model. At Old Town Design Group, we pride ourselves on the ability to create and maintain relationships throughout the entire build process and after you've moved into your dream home. We create these relationships by working closely with clients through every step of the process from initial meetings to handing the keys over.